An evocative picture from George Hodgson Edwards (taken when he lived at Moss-Bay), familiar not only to many Workingtonions - myself included, but to those living as far afield as Keswick, Maryport, Whitehaven and Dumfries! The practice of slag-tipping onto the shore went on until the mid 1960's, when the disposal procedure was replaced with a 'pelletisation' system, the slag being tipped within the confines of the works, and blasted simultaneously with water. I remember standing on the green metal steps of the old Rocket-Brigade station with my Granda - half frightened, half excited - watching this regular, awe-inspiring event. 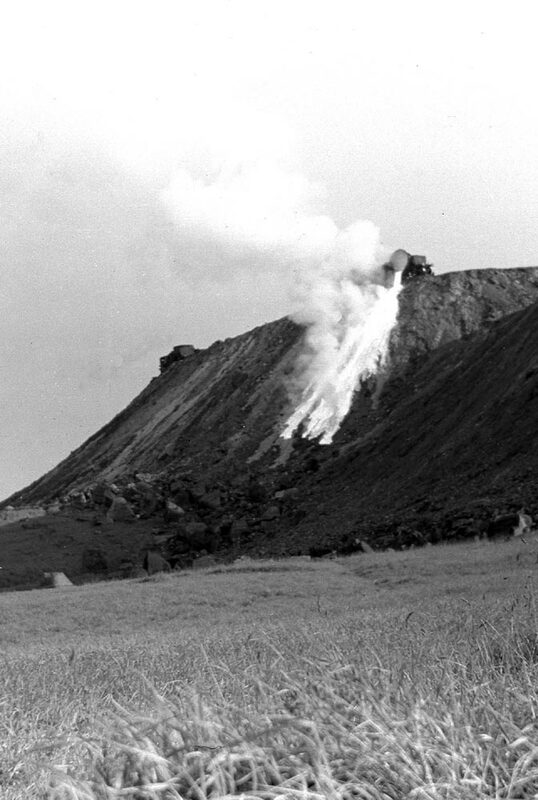 Several tons of white-hot slag racing downwards from above; Workington's own Vesuvius - always mindful of the tale of the slag-engine tipping over the slag-bank in the 1930s, a tragic accident in which one of the locomen lost his life. The other jumped clear and survived. The driver who died was from Berry Street, on the Marsh. It happened around 10 - 11 O'Clock on a Friday morning, and when word got around, my father - and others - left St Michael's school and went down to the shore for a look. A special railway line had to be laid at the foot of the slag-bank to retrieve the loco, which was successfully recovered and continued to be used for many years. A contemporary report of this incident is reproduced below the picture.. Note the slag 'skulls' littering the shore-hills, which by this time were subsumed within the slag-bank. The loco and first slag-ladle can be seen to the left of the tipping ladle. The ladle was held in place on the track by ramming a giant wooden wedge - called a 'Scotch' - under the wheels. The loco then ran backwards, tensioning a chain attached to the ladle. As the chain tightened, the ladle tipped its load, returning under gravity when empty. SLAG-ENGINE TRAGEDY: PUBLISHED IN 'THE STAR' JUNE 22nd, 1934. The contemporaneous report of this horrendous accident is reproduced below, with kind permission of the 'Times and Star'. A corner, forming almost a gully, on the inland side of the large expanse of slag deposits fronting the foreshore at Workington, was to-day the scene of a fatal accident. It was here that a locomotive fireman, assisting with the tipping of a ladle of molten slag, and standing on the front part of the engine, felt the engine shudder, bump over the chocks at the end of the rail-track, and begin to go over the edge. He made a desperate leap for life and landed on solid ground. Swinging round, he watched with fascinated horror the locomotive and ladle hurling headlong down a drop of eighty feet. Trapped and helpless in his cabin, the driver, WILLIAM HODGE, aged 56 living at 13, Berry Street, Workington, was probably killed outright. He was dead when the first man got to the battered engine, and had no doubt been mercifully knocked unconscious immediately the engine and ladle began its headlong dive. The engine, a small 0-4-0 tanker of the type used for drawing ladles with slag from the Derwent blastfurnaces, had arrived at the end of the railway track laid along the top of the bank. When the engine is uncoupled, a chain is attached to the engine, which then retreats a few yards to turn the ladle in its bearing. So far as can be ascertained, a cake of slag remained in the bottom, and in order to clear the ladle, a harder tug was given. The engine acquired such momentum that it over-ran the rails, and with the ladle crashed over an overhanging part of the bank and rolled down in a welter of loose slag, another forty feet, finally coming to rest almost on its wheels. The cab roof and sides were crushed inwards, and Hodge was still in his place after the fall. The wheels of the ladle are deeply imbedded in the slag-bank, under the overhang, and a large part of the ladle was broken away. Many people visited the scene of the accident, and with the air filled by the hiss of escaping steam, gathered on the adjoining pathway to see the tragic evidence of what had taken place an hour or two before. It is many years since a similar accident occured at Workington. Hodge was an old and well-known driver, and his fellow-workmen were shocked to learn of his tragic end. The fireman on the locomotive was George Fleet, of Workington. He escaped from bodily injury, but on his return home was found to be suffering considerably from shock. The inquest on William Hodge was opened by Colonel D. J. Mason, Coroner for West Cumberland, at the infirmary last evening and adjourned until Tuesday. Evidence of identity was given by George Edward Fleet, 1, Bird Street, who was fireman on the locomotive. Hodge, he said, was a bachelor and lived alone. He was very badly crushed, particularly about the head. At the inquest on Tuesday June 26th, the court heard how one of the three-and-one-quarter inch high rail-stops was missing from the end of the track where the accident happened. It was later recovered from the slag-bank. A similar accident had happened ten years previous to this one, where the point had been raised regarding inadequate rail-stops. The principal witness, George Fleet - the loco-fireman on that fateful day - claimed that the rail-stop had been perfectly adequate, and that even if the stops were a foot high - an impractical proposition - the engine and ladle would still have gone over the edge. The evidence given by George Fleet was that once the locomotive and ladle had reached the rail-stops, he had uncoupled the locomotive from the ladle, and fitted the ladle-chain. The driver then pulled the loco away (back towards the steel-works; locomotives always pushed the ladles up the slag-bank), tipping the ladle, then applying the steam-brake. The engine-cylinders were then full of steam. When the engine was reversed, it released the steam-brake, shooting the engine forward towards the ladle. As the force of the loco pushed the ladle over the rail-stops, the steam-brake was applied again, but the full weight of the ladle drew the locomotive over the edge. It was at this point that George Fleet, who was perched on the smoke-box end of the locomotive, made a jump for it and landed safely. Not so poor William Hodge, who remained trapped in his cab while the locomotive did one complete somersault, rolling the rest of the way to the bottom. No blame was attributed to any particular person, the decision from the jury being that the death was entirely accidental. William Hodge was interred in Harrington Road Cemetery on the 25th June 1934, the funeral leaving from the residence of his Sister, Mrs Adams, of 45, Napier Street, Workington.